The Tyler County Historical Commission’s “Tyler County on Tour” took place yesterday and as you probably remember, the Peter Cauble House was included in that tour and Ernestine and I served as docents. We wanted period furnishing for the house and you authorized me to purchase two iron beds. Time was short and I was unable to find any suitable old beds and purchased two reproductions for $843.60. Later one lady in Woodville donated an old bed and after seeing it I decided to use it and return one of the new beds. After shipping and restocking fee the one bed cost us $632.95. Erlene Ingle of Woodville used items from her three antique shops and home to furnish the rest of the house. When you see the pictures I think you will agree, she did a really nice job. I know most of you are living in a drought area but down here we have had very few days in the last few weeks without rain and that also applies to Tyler County. When we arrived at Peach Tree Village Friday afternoon the ground was saturated and water standing in all the low places. It started raining that evening about 7:00 pm and rained all night and continued through out Saturday – non stop. We decided to stop people at the highway and shuttle them to the house and back in order to keep them from getting stuck and help get them to and from the house without getting too wet. 2″x12″ boards were used as a bridge over the ditch next to the road. Unfortunately we only had 16 paying guest and 25 total which included Camp Ta Ku La Staff and Commission members. Those that did brave the weather seemed to really enjoy the house and learn about the history of it and the Peter Cauble family. Huntley mentioned possible having the Cauble House on next year’s tour since very few people got to see it this year. We hope everyone enjoys this posting of pictures of the event on our website so everyone can see how the house was decorated and get ideas on what we want to do on a more permanent basic. I have attached a picture of the docents which should bring a smile to your face and maybe even cause you to laugh out loud. It will hopefully also serve to increase your interest in seeing the rest of the pictures. 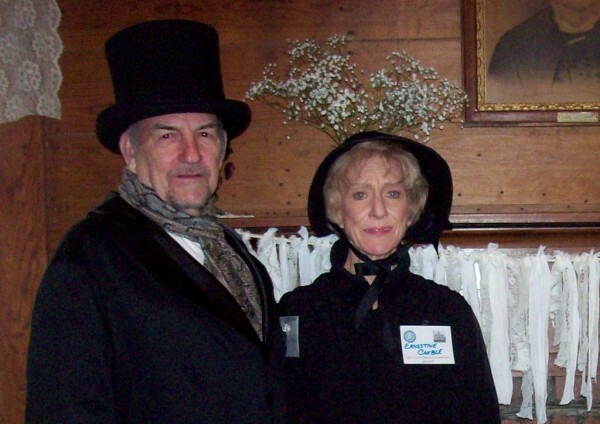 Ernestine and I enjoyed dressing up and representing the family. We met some nice people and had a fun day sharing our family history.